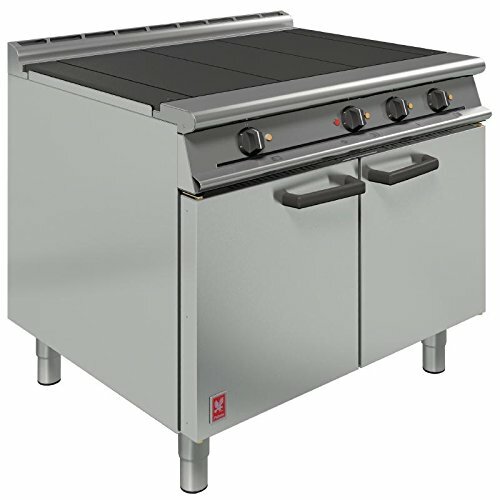 Full depth heavy duty cast iron hotplates allows multiple cooking positions across hob cooking area Full width, removable drip tray retains spillages and keeps unit clean Vitreous enamelled oven chamber is easy to clean and keep clean. The cornerstone of the commercial kitchen, a Falcon Dominator Plus E3101 provides incredible functionality, versatility and reliability to produce impressive results, whether used in a restaurant, canteen, hotel or busy takeaway. Designed for maximum output, the main oven features a large double sized (2/1) gastronorm compatible cavity, allowing large quantities of food to be cooked at once. The three rectangular cast iron hotplates are independently controlled, ensuring maximum versatility as multiple pans can be used across the cooking area. The durable stainless steel construction and vitreous enamelled interior is attractive and easy to clean.